Orproject, has been shortlisted for the Singapore's World Architecture Festival in October. The concept is gigantic inflatable bubbles designed to canopy over parks and developments to provide fresh air in congested and polluted cities. Orproject architect Raja Sodhi says the design is "a response to the bad air quality, which is affecting many cities in developing countries like India and China". Bubbles could tackle air pollution issues in cities such as Beijing, where the need for fresher air has reached an all-time high. The Shanghai Academy of Social Sciences reports that China's capital has environmental conditions that are “almost unfavourable for human living”. Orproject hopes to construct large canopies over major cities to control temperature and reduce air pollution and Mr Sodhi has confidence his light-weight and affordable design is safe in their hands. Combining a complex mathematical algorithm and ethylene tetrafluoroethylene (ETFE), the geometry of the light-weight system simulates leaf veins or butterfly wing, making a truly unique image. Ground source heating will heat and cool the air, whilst electricity will be entirely solar, derived from solar cells on the surface of the canopy. 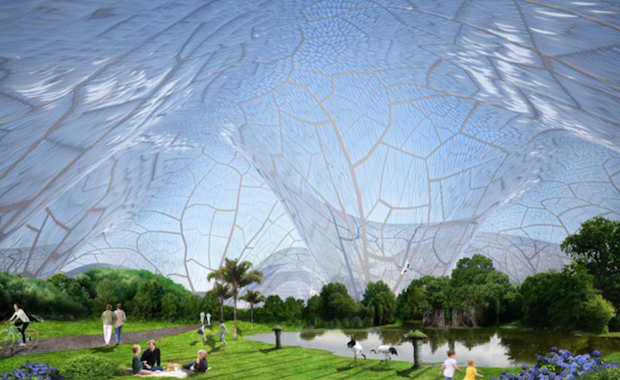 If the Bubbles project can exist over-top of botanical gardens, there is an opportunity for climate-controlled green houses to grow plants from around the world, drawing tourism to the park. The roof system's usage can vary from botanical gardens to other applications such as playgrounds or schools, or even outdoor areas of offices and shopping centres.